Social Support: Battle-Hardened Lessons from Top Practitioners: A Panel Discussion with Leading Social Media Strategists in Tech Services. The was the top attended session at TSW, exploring the inner-workings of social media–best practices and lessons learned–and uncovering which strategies, tools, and processes are being used most successfully by leading services organizations. The session leader was TSIA’s own Shawn Santos, with a very impressive panel of experts: Lois Marie Townsend from Hewlett-Packard, Radha Penekelapati from salesforce.com, and Toby Richards from Microsoft. Driving Recurring Service Revenue: How SAP, EMC, and BMC are Transforming Their Service Business into a Growth Engine. This Services Technology Advantage Case Study session was the 2nd highest attended session at the event. The audience heard from SAP, EMC and BMC service leaders on how they have taken their service business to the next level. Panelists discussed how increased focus, visibility, and control has helped them transform their service business into a revenue growth engine. The session host was Keith Leimbach from ServiceSource, with panelists Christophe Bodin from BMC Software, Sara Hepner from EMC, and Roger McConville from SAP. Positioning the Support Organization as the Leader in Innovation. The third most attended session from Day 1 and Day 2 was also a Services Technology Advantage Case Study session. Presenters Tarik Mahmoud from Cisco and Diego Ventura from noHold explained that intelligence collected during a support interaction provides valuable insight for marketing, product development, engineering, and more. The challenge is that information is siloed and not transformed into measurable ROI. noHold’s customer, the leader in networking devices, has found a way to break the mold and create a paradigm shift by syndicating opportunities across all business units. The Artful Manager: How to Leverage Business Metrics to Greatest Effect. Number 4 on the top attended list was this panel discussion, led by TSIA’s Stephen Smith, with panelists Syd Garrett from Cisco Systems, and Frank Coleman from EMC, presented an interactive discussion about how to optimize your metrics and business intelligence program. Demystifying Service Revenue Growth. This session, presented by Julia Stegman, TSIA’s VP of research for service revenue generation, revealed the results from the Service Revenue Generation benchmark, which is the first and only industry benchmark for recurring services. Participants learned what actual performance is, which is an aggregate of impressive industry leaders from our Service Revenue Generation Founding Members. Blending Knowledge Management and Social Media for Service and Support. Number 6 on our list was presented by Lynn Llewellyn and Kevin Mitts from VMware, who shared social media and knowledge-management strategies from VMware® Global Support Services. The company has developed an innovative, award-winning program that provides invaluable assistance to its customers and helps deflect support cases–the Social Media Guidebook for Service and Support Responds to Customers Faster and Increases Satisfaction. Our Journey through Knowledge Management: Business Challenges, Best Practices, and Lessons Learned. Number 7 on the top attended list was also a Services Technology Advantage Case Study, presented by Joni Ortbring from Audatex, a Solera Company, and Tom Kolano from Consona. The session focused on how Knowledge-Centered Support (KCS) principles, along with a feature-rich KM system, allowed Audatex to focus on knowledge as a community asset providing accurate information to their clientele and associates in near real-time. Channel Optimization and Why This Matters to Your Business. This session was originally going to be presented by my research pal, Sally Foster, but due to an injury, our fearless leader, JB Wood, stepped in and drove the session. Customers are becoming more and more interested in engaging with service providers via multiple channels of communication. It used to be that calling a support center or sending an e-mail was what you did. The cost of these channels is almost becoming prohibitive depending on the volume of incidents a provider handles. Customers want solution providers to engage with them in the way that they want to be served. This session looked at evolving channel strategies and how successful companies are approaching customer channel preferences. Transform Your Services Business To Create A Strategic And Sustainable Footprint With Your Customer.Number 9 on our list is another customer case study, part of the Services Technology Advantage track. Presented by Ruth Fornell from NCR, the session described how NCR Corporation continues its evolution into a services led, software driven, hardware enabled solutions company. Attendees learned how NCR uses Compuware Changepoint Professonal Services Automation (PSA) to differentiate themselves while creating a broader, more strategic and sustainable footprint with their customers. This case study presentation was targeting services executives looking to transform their services business through global knowledge sharing, centers of excellence and organizational transformation. Thanks to everyone for attending our event, and a special thanks to all these presenters for creating such dynamic topics and content! Every year at the Technology Services World Best Practices conference, the most innovative companies compete in live stage demonstrations at Service Revolutions to win the coveted TSIA Vision Award. Winners are selected by audience members who vote after each presentation. Introduced in 2010, the TSIA Vision Award recognizes game-changing ideas in technology services that advance the industry and shape emerging trends. Based on the theme “True vision is having the intelligent foresight to define a better, more productive future,” winners receive a TSIA Vision Award trophy presented at a gala awards luncheon immediately following the Service Revolutions event. The following companies gave live demos today as part of Service Revolutions. HP. Predictive Customer Satisfaction Model. The Predictive Customer Satisfaction model provides a control mechanism, for perceptive performance indicators like Customer Satisfaction, using a scientific methodology to drive desired results and better business use for the IT Infrastructure. The model identifies business factors related to customer satisfaction, translates the business factors to measurable metrics and based on those metrics predicts variations in performance leading to lower customer satisfaction. The Predictive Customer Satisfaction model brings immense advantages to both the customers and the service providers, alike. IT User Satisfaction is a key indicator of the success caused due to high availability of the IT infrastructure. This model helps us assert that “even service perception should not be a coincidence”. SAP. Advanced Delivery Management, Learn how SAP Services extended the innovation of modular re-usable components from automotive, construction and other industries to SAP service delivery. With the SAP Advanced Delivery Management SAP is redesigning its services portfolio and delivery approach to achieve faster delivery while lowering the cost and risk. This innovation is possible thanks to lessons learned from delivery of Rapid Deployment Solutions (sap.com/RDS)- smaller, modularized packages – and extension of the concept to the entire services portfolio. The audience voted using live response units and the winner was SAP and ChatID. Congratulations to the winners, and to all the amazing presentations! See you next year for Service Revolutions 2013! My First Book, Lessons Unlearned, Is Officially Launched! This week I get to put a big check mark next to an item on my bucket list: become a published author. This has been a dream of mine since childhood, and even though I’ve been publishing 300-400 pages of research reports every year since 2001, a book is different. And this week that dream came true. My first book, Lessons Unlearned, was launched this week at our Technology Services World Conference in Santa Clara, and this morning I gave a keynote highlighting sections of the book for TSW attendees. Monday and Tuesday evenings I spent on the Expo Solution Stage, signing copies and answer questions. It has been a lot of fun. 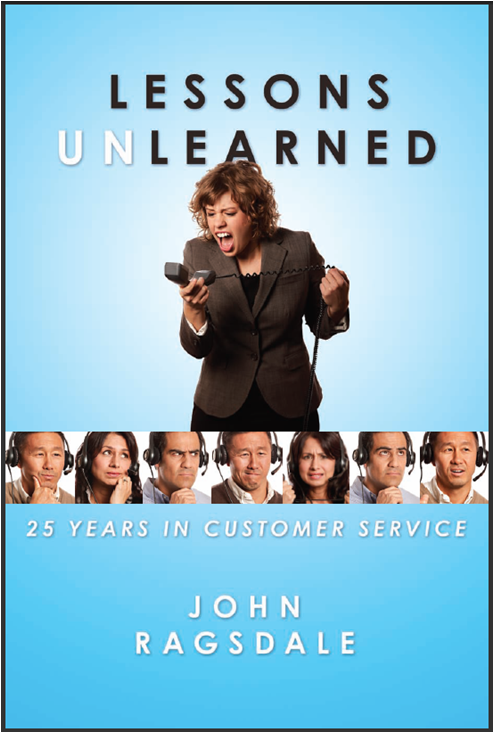 I’ve been calling Lessons Unlearned a “memoir-based tell-all book” about my 25 years in customer service. It is definitely a memoir, and it is definitely filled with gossip from Silicon Valley and the world of service. But I’m hoping many of you will see it as a resource, especially for customer service professionals. God knows I have screwed up many, many times over the years, and hopefully by reading this book, you can learn what I’ve learned without having to screw something up to glean the knowledge. There are a million books out there on how to be a sale person, or a developer. But you don’t see much on the subject of how to be a high performing service technician or service manager. Well, now there is a book on the subject, describing my approach to customer management and employee management, with tips on hiring, coaching, motivating, and writing reviews for employees. Though clearly the book is written as a business book for the service industry, but it is also written for customers. I believe if customers understood how support works, the metrics that drive us and the cost associated with giving good service, they would not only have more appreciation for the service professionals they encounter, but also better understand the support process and maybe even help it move along more efficiently. If nothing else, I hope consumers who read the book take this point away: good service is worth paying for. Lessons Unlearned talks about more than customer support. From my years working for high tech firms, I have chapters on knowledege management, and how to select and implement enterprise technology. I also have a chapter called “advice for startups,” with a list of challenges I see small companies struggle with on their way to becoming big companies. In my 12 years of being an analyst, I have worked with some of the most messed up companies ever created… but I’ve also worked with some incredbly successful firms…and quite a few who didn’t succeed financially but were filled with brilliant people and ideas. I tried to capture the best approaches for all of these experiences and include them in the book. The hardcover and electronic versions of Lessons Unlearned are available on Amazon. For multiple copies you can receive volume discounts by purchasing through TSIA. I’d like to thank the TSIA team for all the help in making Lessons Unlearned a reality, in particular, our tireless editors Suzanne Hite and Suzanne LaBounty, who gave up many nights and weekends to meet editing deadlines for the book. Thanks for all the kind feedback. I look forward to answering all your questions about Lessons Unlearned! Today at Technology Services World in Santa Clara, CA I co-hosted a “workout session” on proactive channel management, with my friend and longtime TSIA member, Tarik Mahmoud from Cisco. Over the last two decades, customer support interactions have evolved from phone to a variety of channels, including email, web chat, self-service, and now social media. Support organizations have been largely reactive about these changes, adding channels as customers demand them and allocating staff as channel volumes evolve. But I’m beginning to see a very different approach becoming common today: companies will no longer sit back and watch channel volumes roll in, they are taking charge and helping manage volume by channel, nudging—and sometimes forcing—customers to move to more effective and less-expensive channels. No one knows more about this subject than Tarik. In 2008, Cisco’s Linksys division made the brave decision to eliminate email support, which was their most expensive and least effective channel. Email has always been a challenge for technical support, with many back-and-forth emails required to get all the necessary details from customers. With the lag time waiting for email responses, average incident resolution time grows, and incident costs soar. With a careful strategy involving lots of marketing, Cisco eliminated email support without a single customer complaint, successfully transitioning the majority of email volume to an unassisted channel–the online forum. The remaining traffic moved to the web chat channel. There was no impact to phone volumes. I documented this case study in a research report, “The Challenges of Tech Support via Email: Linksys Ends Email Support, Successfully Migrating Traffic to Forums.” TSIA members can find this report on our website–search by the title (or email me for a copy if all else fails, I know our search engine leaves a lot to be desired). Do you know your cost and satisfaction by channel today? What are your best/worst channels? Do you know your volume by channel today? Which channels are growing/shrinking? How do you influence channel adoption today? News letters, user groups, training classes? What new approaches should you consider to influence channel adoption? What has worked for you? The discussion was both fun and enlightening. We talked about how channel preferences are influenced by demographics, the importance of building use cases by customer type to establish which channels you should have, and how to encourage customers to try a new channel, such as chat. Everyone was interested in the details of Tarik’s email story, as well as a new example of proactive channel management he provided. When the chat costs in a single country in Europe began averages 2x or 3x the cost of a phone call, chat was no longer offered in that region. When the customer selects that country from the pick list in the chat tool, they receive a message to please call for support. That way they are delivering the best experience for the lowest cost. So it turns out proactive channel management can be a very granular strategy. Each product may have different demographics, i.e., different channel adoption, and each country or region may have drastically different channel costs. I hope everyone enjoyed the session as much as I did! TSW Best Practices Opens with my Innovation Tour! TSIA’s Technology Services World Best Practice Conference kicked off today at the Santa Clara Conference Center. The conference opened at 12:45 with my Innovation Tour. The tour is a presentation of all the finalists in the Spring 2012 Recognized Innovator Awards, which are presented to partners of TSIA at our Spring and Fall conferences. Partners submit applications for consideration, and case studies documenting business results are required. Winners are selected by a panel of TSIA members and industry experts. The content for TSW 2012 Best Practices focused on “Defend, Optimize and Innovate,” allowing member companies to improve core operations while looking for new approaches to streamline operations and generate incremental revenue. Technology firms cannot accomplish these initiatives alone, and the Recognized Innovator Awards showcase the role TSIA partners play in enabling the success of today’s global service organizations. ServiceSource, whose suite of cloud applications and managed services better connect and automate clients’ recurring revenue ecosystems. SYKES, whose new Sales Assist offering blends proven support program excellence with sales program goals to create a new revenue stream for clients. Value and Pricing Partners, whose TPS Pricing RapidAct™ provides PS leaders with guidance on their rates position relative to peers, and how to immediately improve rates performance to drive bottom line results. Verghis Group, who designed a new approach to metrics, based on research from fields as diverse as aquaculture, championship weightlifting, traffic engineering and firefighting. The winners will be announced on Wednesday during the closing awards ceremony. Hope to see you there! 2012 TSIA Member Technology Spending Report: Results Live Today! TSIA’s sixth annual member technology survey is complete, documenting member adoption, satisfaction, and planned spending across 24 areas of services and technology used by education services, professional services, field services, support services, and service revenue generation. According to the survey, TSIA members have an average annual budget of $2.99 million to purchase, implement, and maintain service technology. Several areas of technology saw increased adoption over the last year, particularly enterprise mobility and reporting/analytic platforms, which are now seeing adoption across all service divisions. Satisfaction scores for technology and services in place were unimpressive again this year: only one category averaged above a 4.0 on a five-point satisfaction scale (1 being very unsatisfied; 5 being very satisfied), and multiple categories saw averages below 3.5. Planned spending is very high for 2012–2013, with double-digit percents of members planning additional purchases in every category covered by the survey. Top spending categories include online communities, knowledge and content management, and reporting platforms, with all TSIA disciplines planning investment. 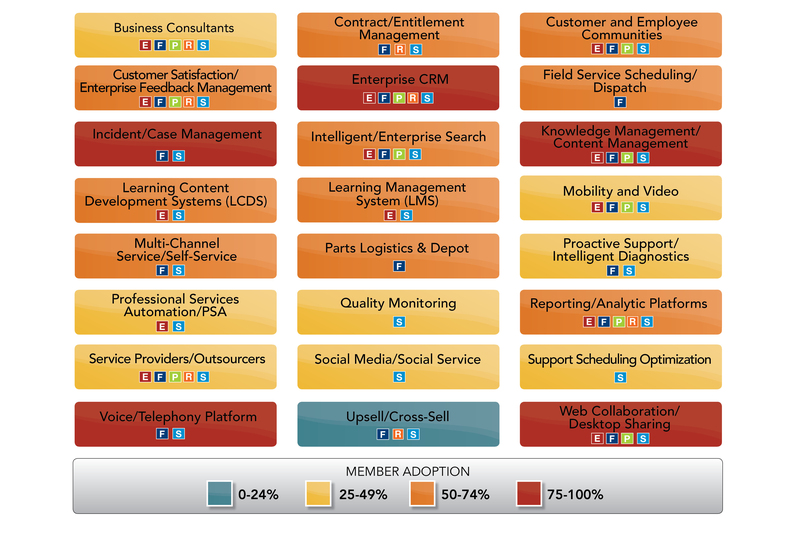 Here is a look at this year’s Heatmap, which is a color-coded guide to technology adoption. I’d like to thank everyone who responded to this year’s survey, and a special thanks to Suzanne LaBounty, our intrepid editor who made time for all these reports in the middle of the TSW crush! Thanks for reading, and hope to see you in my Power Hour session later today! You are currently browsing the Ragsdale’s Eye on Service weblog archives for May 2012.